Ginger is a spice and medicinal plants that rich in benefits. Ginger (Zingiber officinale) is a rhizomes plant, which are very popular as a spice and medicinal materials. Having a dominant spicy flavor due ketone compound, named zingeron. with the taste a lot of people use it as a drink to warm the body. There are 3 kinds of ginger, big white ginger, small white ginger, and red ginger. Big white ginger has a large and bulging rhizome, small white ginger has a rhizome rather flat and slightly bulging. While red ginger rhizome color red but its size is smaller than the small white ginger. In principle, ginger consists of hundreds of chemical compounds active. Each of these compounds are known to have certain properties for the body. Phenol compounds, for example, shown to have anti-inflammatory effects and been found helpful for treating joint disease, and muscles tense. In addition to phenol, ginger also contains zingilberene and Shogol. This compound is well known as an anti-oxidant and also effective against cancer and heart disease. Other important compounds found in ginger are essential oils. This oil is beneficial to reduce pain, as anti-imflamasi, and good bacteria exterminator. Essential oils are also known contributing a characteristic aroma of ginger. Meanwhile, the sensation of spicy ginger comes from zingiberen and zingiberol that also found in the essential oil. Ginger is effective in preventing travel sickness. The effectiveness of ginger beat hangover medication that is widely available in the market. 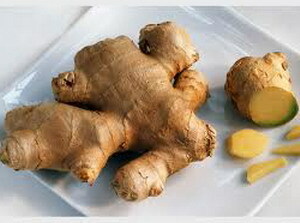 In addition, ginger also efficacious relieve morning sickness or nausea that often affects pregnant women. Extracts of ginger is very beneficial for those who suffer from bloating and pain. Ginger can be used to treat indigestion and irritable bowel. Recent studies have shown that ginger extract useful to maintain heart health. Ginger may help preventing the atherosclerosis. The benefits of ginger is similar to aspirin that can reduce blood clotting. Ginger can also help maintain healthy cholesterol levels and improve blood circulation. Ginger contains a compound called gingerol. These compounds responsible for aroma and anti-inflammatory properties. When searching for anti-inflammatory drugs make sure drugs had gingerol content. Such as aspirin, gingerol can be used to reduce fever and cough. Using ginger means it will suppress the emergence of side effects as they are contained in the chemical drugs. Extracts of ginger is also beneficial for people with arthritis and osteoarthritis. Ginger is believed to contain components that can inhibit COX. COX is one of the chemicals the body that is responsible for onset of inflammation. COX inhibitor prescription drugs usually have a variety of side effects that could be detrimental. Ginger, a natural herbal offer similar benefits without side effects. In clinical trials, ginger was able to relieve pain, improve joint movement and reduce swelling commonly associated with rheumatoid arthritis. Ginger can also help relieve back pain and migraine headaches. Ginger is useful for treating people with high blood sugar and high blood pressure. Besides ginger, turmeric is also known as a spice a has similar properties. Ginger together with grape seed extract, can help reduce fever and similar problems that occur during allergy season. People with allergies will be pleased to hear that ginger does not cause drowsiness and other side effects commonly accompanies antihistamines (anti-allergy). Rough and dull hair can be softened with ginger. The content of essential oil in it can soften and scent the hair. Combined with olive oil, essential oils will strengthen the ginger. Make 2 tablespoons ginger juice, mixed with 2 tablespoons of olive oil. Stir well, apply on hair and scalp. Let stand for 25 minutes and Wash as usual, do 2 times a week. Ginger is great for treating oily skin, some minerals contained in ginger would eliminate oil, mixed with some other ingredients such as sea salt, cinnamon and nutmeg. Take sea salt, ginger is grated, ground cinnamon and a teaspoon of nutmeg. Mix together and add enough water until the pasta and can apply. Apply on face, leave 20 minutes, rinse with cold water until clean. Aging skin, such as dullness, wrinkles and sagging making appearances become less attractive. The combination of ginger, coffee, avocado and cinnamon leaf oil will take care of the skin to stay young. Mix one cup of coffee powder, half a cup of avocado or avocado oil that has been destroyed, a teaspoon of ginger that has been shredded, and a few drops of cinnamon leaf oil. Stir all ingredients until well blended. Spread the herbs throughout the body, while a massage circle. Rinse with water to clean, do two to three times a week. One of the easiest ways to smooth the skin is take advantage of ginger and pomegranate. Ginger serves to calm and clear the dirt on the skin. While vitamin C in pomegranates can smooth the skin. Take two tablespoons of grated ginger, mixed with the juice of a pomegranate. Apply on face, leave 20 minutes and rinse with clean water. Perform 2 days. Ginger granules will gently remove dead skin cells. when combined with sea salt and orange peel will further strengthen the functions of ginger. Mix two cups of sea salt, two tablespoons of orange peel slices and three drops of ginger juice. Stir well, apply on the body with a circular massage. Rinse with cold water. Do it once a week. Leather soles are usually coarse and thick. but your feet can be smoothed with a mixture that consists of ginger, brown sugar, aloe vera, honey and oatmeal. Create a potion that consists of red sugar, aloe and oatmeal each 2 tablespoons. All the ingredients are mixed and add the lemon juice, grated ginger and honey respectively 1 tsp. Stir all ingredients, apply on the sole of the foot evenly, let stand 5 minutes. Rub gently so that all dirt and dead skin cells shed. Rinse with clean water and do it once a week.